We are so excited that Sedona Wedding Studio members have been featured in yet another major Arizona wedding publication. 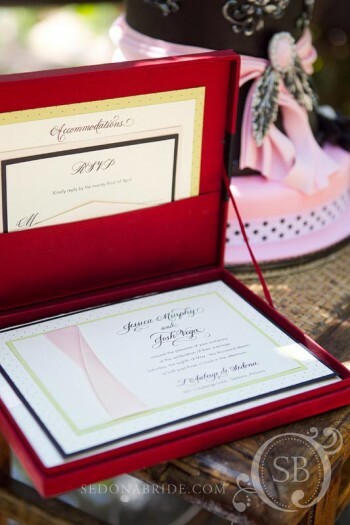 Teri Ambrose, Publisher of Arizona’s Finest Wedding Sites and Services Magazine, and member of the SWS, wanted an elegant ceremony site and a feel that somewhat broke away from the everyday wedding typically seen in Sedona. Sedona Wedding Studio members stepped up to the plate and organized another photo shoot. L’Auberge de Sedona‘s Cottage Side Lawn was chosen as the site for the exciting photo shoot which was styled and coordinated by Sedona Wedding Studio member, Laura Marolokas, Heart of Sedona Weddings. This is an important publication for brides planning a wedding anywhere in Arizona and especially a Sedona weddings. Pick up your copy today! Although the feature is a generous four pages long, space in the magazine does not allow for every image from the shoot to be used. We thought it would be fun to show some additional images by Sedona Bride Photography that do not appear in the magazine. Planner, Laura Marolakos, wanted an elegant vintage look for the shoot while at the same time adding a twist that brought the look up to date. Events By Show Stoppers designed an elegant gazebo draped with delicately embroidered sari fabric. The tie off points were garnished with black tassels that held luscious sprays of phalaenopsis orchids that spilled over with lavish style and opulence. 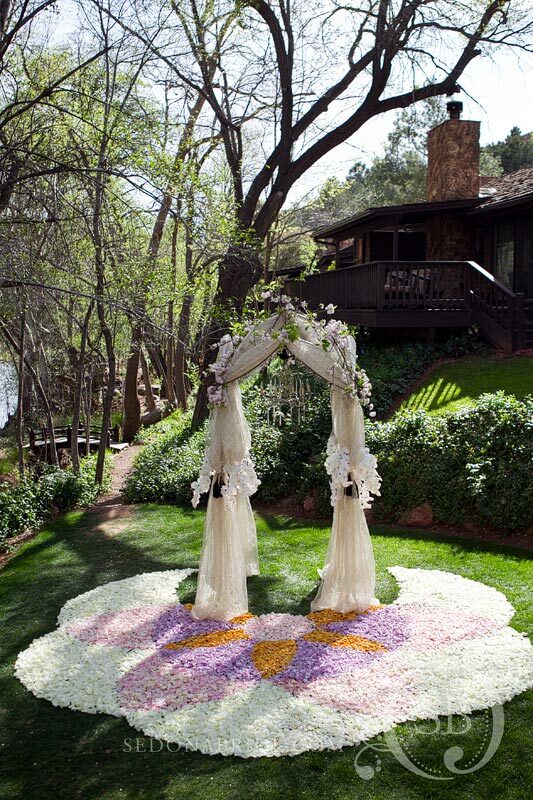 L’Auberge de Sedona has become one of the most popular wedding sites in Sedona Arizona. The shady lawn, soothing sounds of babbling Oak Creek and the red rocks peeking through the trees is a powerful persuasion for brides considering having their weddings in Sedona. Beautifully appointed cabins with decks that overlook the Cottage Side Lawn are a wonderful place for family and guests to stay. The L’Auberge experience is hard to beat. The rose petal carpet had an unusual color scheme of ivory, blush pink, lavender and dusty gold. It was designed in a geometric pattern of intersecting circles that surrounded the gazebo perfectly. Branches of blooming cherry blossoms were added to the top of the gazebo that featured a vintage chandelier complete with a copper patina and sparkling prisms that threw dancing rainbows of light across the area. 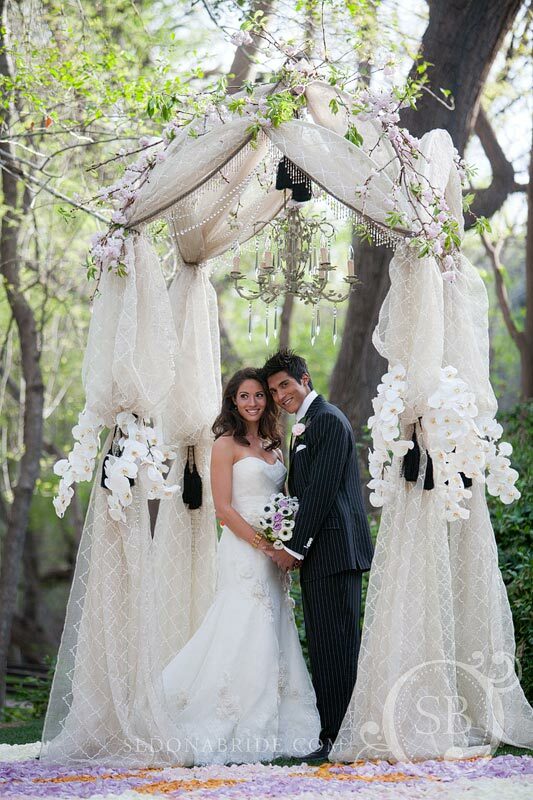 Yards of sparkling swarovski crystals were draped across the top and added even more spectrums of light. 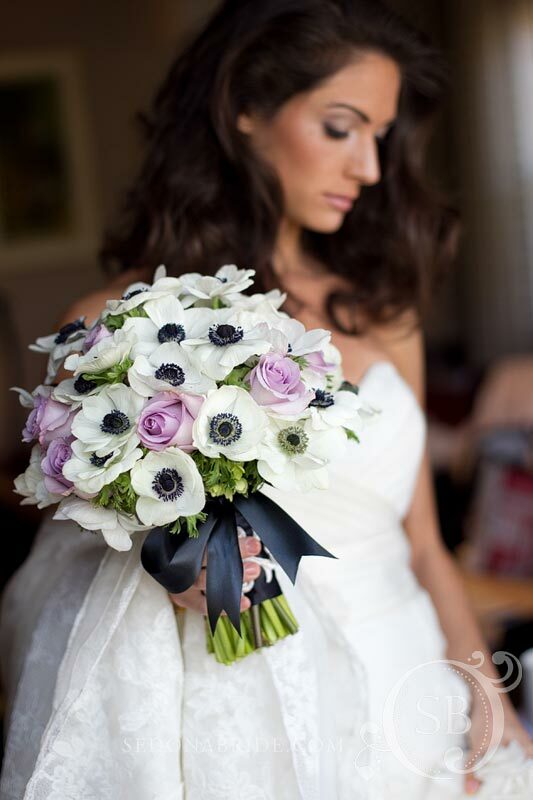 The bride carried a romantic bouquet of white anemones with black centers mixed with fragrant lavender roses. 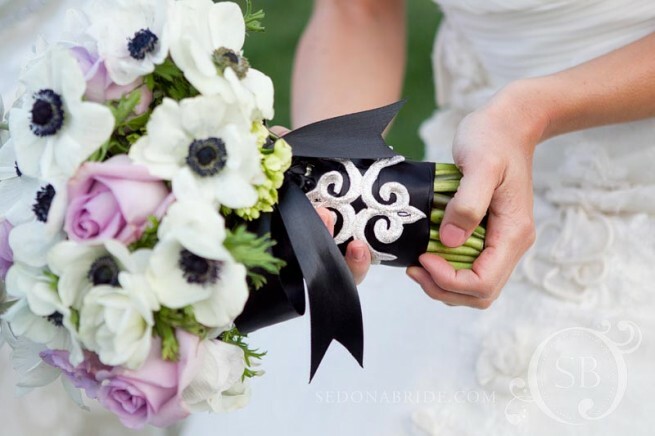 The handle was casually tied with black satin ribbon and overlaid with a silvery-white embroidered trim in a double row of classic fleur de lis. 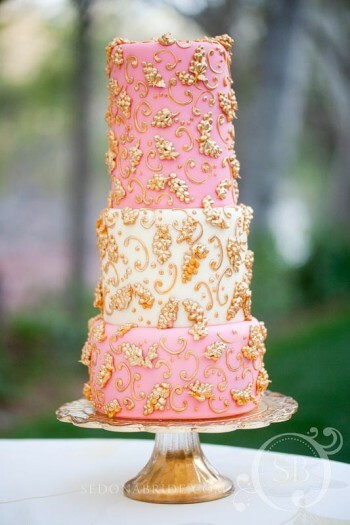 The combination of color and texture was lovely with the gown that was provided by Mariee in Scottsdale. 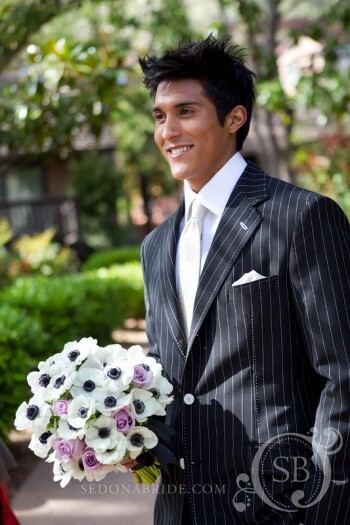 Eddie Fisher of Saviero Custom Clothier provided the handsome tailored suit and personally made sure every detail was perfect. Eddie’s choice of color and textures could not have been more perfect. 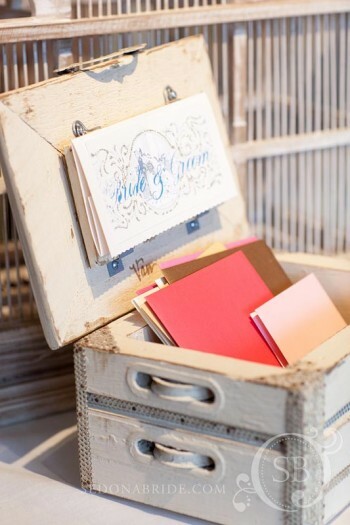 So many important details we overseen by planner, Laura Marolakos of Heart of Sedona Weddings. 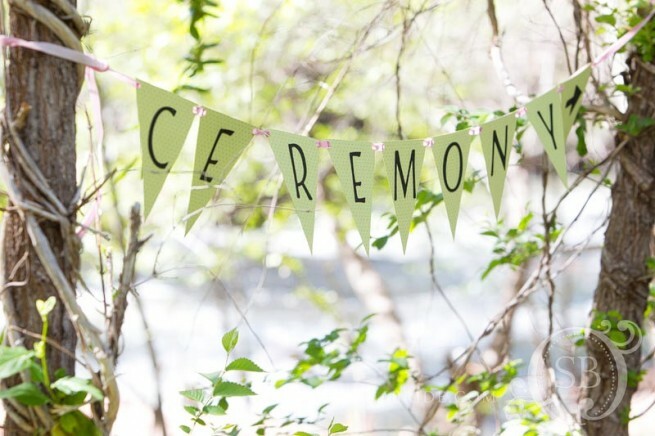 These charming pennants were hung in the trees and pointed the direction to the ceremony site. Beautiful place settings were provided by Deb Beggs of Classic Party Rentals. 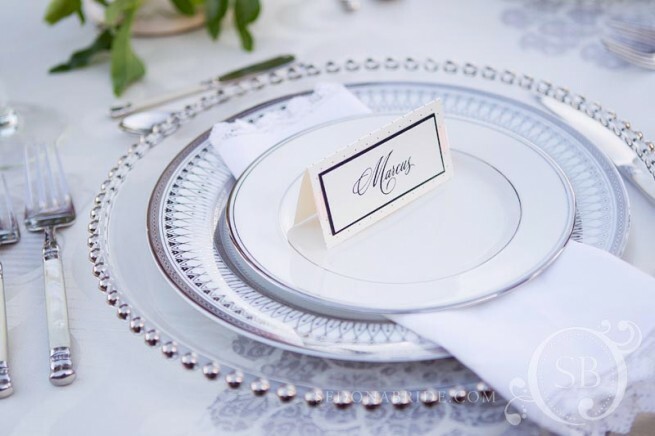 The pattern on the napkins and linens, together with the silver trim on the china, was beautiful with the clear chargers and complemented Laura’s choice of formal silverware with mother-of-pear handles. 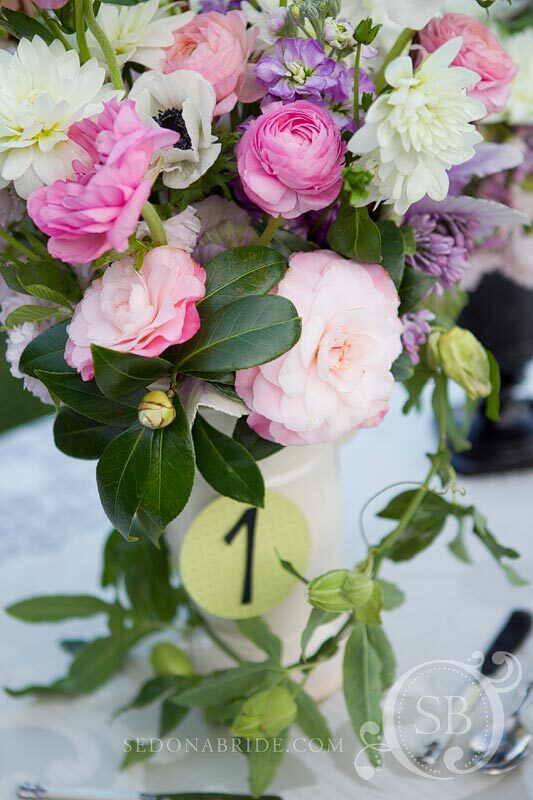 Lovely flowers were provided by Events By Show Stoppers. Ken designed a casual garden feel centerpiece complete with Camellias and Passion Flower vine gathered from his personal garden. 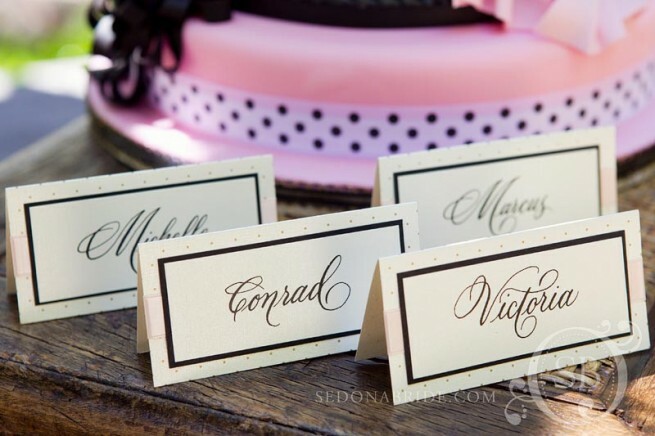 Celebrations In Paper provided all the beautiful place cards and paper products. 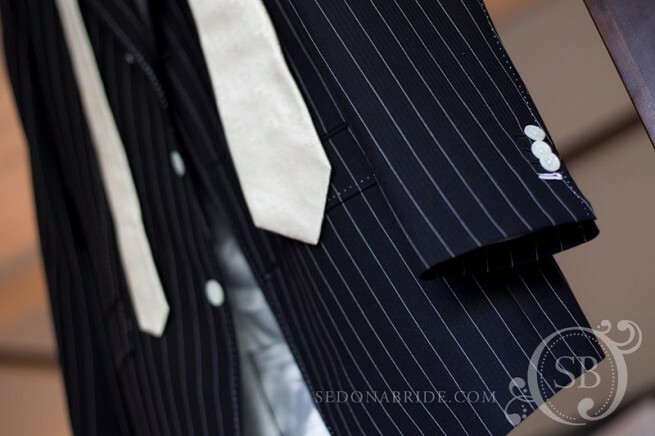 Great details can make all the difference between an ordinary wedding and a really beautiful Sedona wedding. Special thanks to Anne Marie at Hummingbird House for providing an assortment of charming props for the shoot. 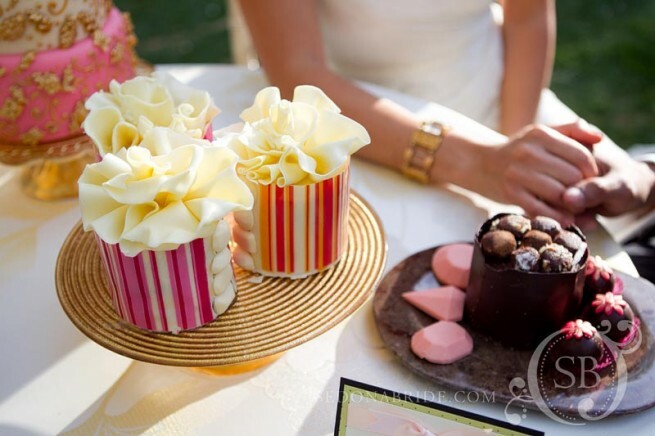 An assortment of colorful cakes and sweets were provided by Sedona celebrity cake artist, Andrea Carusetta of Sedona Cake Couture. 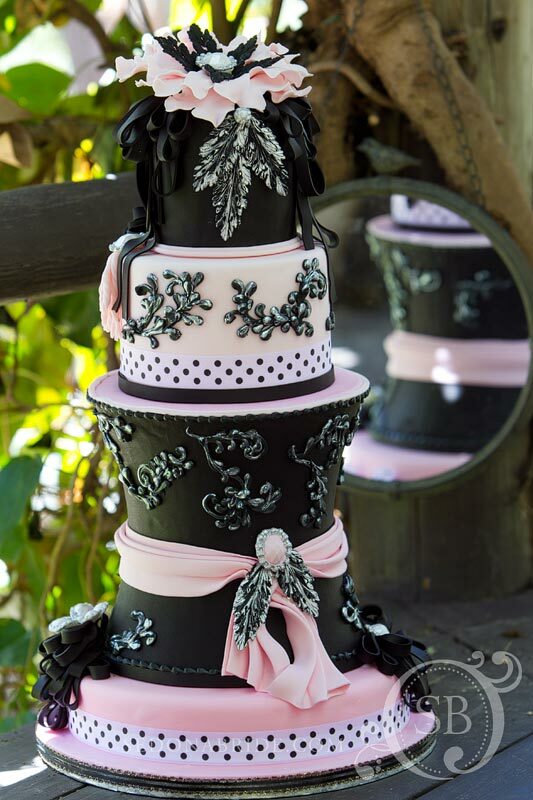 Andrea created this cake masterpiece that was the perfect color and style. Our bride and groom enjoy a romantic toast along the banks of Oak Creek. So ended another exciting day of shooting for the Arizona’s Finest Wedding Sites And Services Magazine feature. 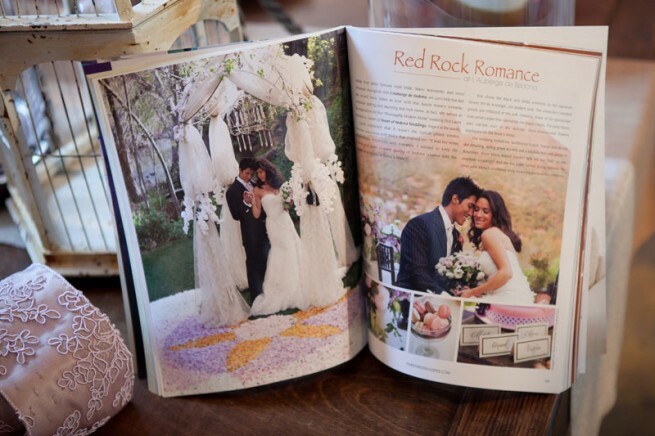 Bride’s that are planning a wedding in Sedona, or anywhere in Arizona, will find this great publication a valuable and indispensable resource.